A fun and unique place to visit in London is Camden Town, which was filled with pubs and cute little restaurants, but also a mix of vintage, funky and quirky shops. It was different from the atmosphere in central London, would definitely recommend visiting it. Now, can we acknowledge how majestic this unicorn is? I mean, just look at it! I simply had to take my pictures next to it. For the first time in a while, my look is a bit colourful combining a tartan shirt, which I wore backwards creating an open back. It offers a flirty vibe in a subtle way. To finish off the look, I paired it with these silver statement shoes. 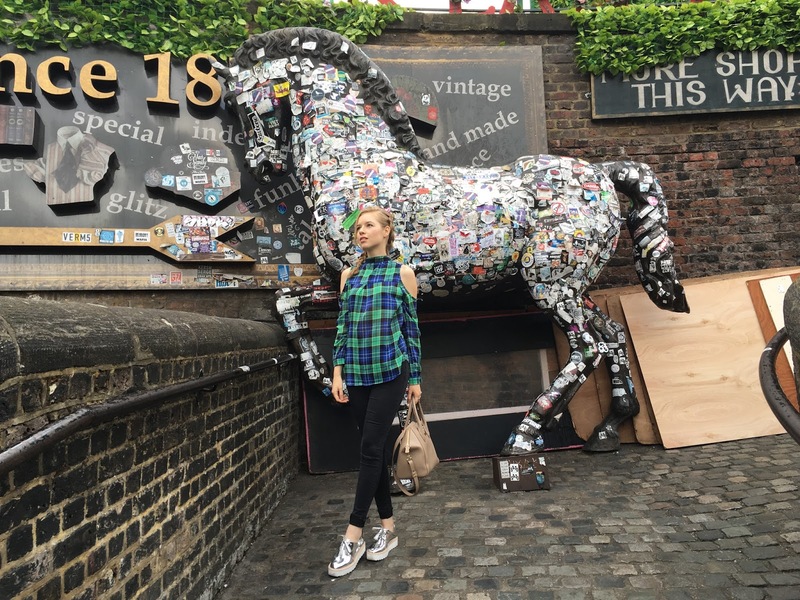 Have you visited Camden Town? Thanks beautiful, it really is a cool place. What a fantastic background. I love your shoes. haha I work in Camden! Amazing pictures and such a great outfit! Beautiful photos and gorgeous outfit! 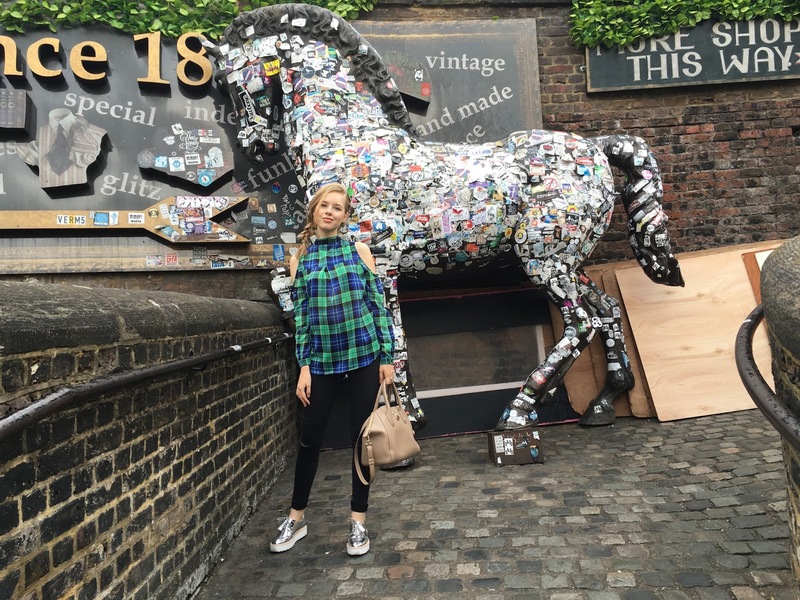 I'm loving the horse in the background :) I hope that you had a wonderful time at Camden Town, I would love to visit one day! It sounds amazing! I had the best time and I hope you'll visit it soon! It really has a fun vibe. Ahaha, thanks hun! Wonderful place to visit :) You look so cute, Carina <3 Loved the look! I love this top! I never think of flannels with open shoulders, but seeing you wear it makes me want to track one down and purchase it! :) thanks for sharing girl! Hopefully you'll find one, they are so fun to style. Hope you'll travel there soon! I love Candem! I want to go back to London soon!!! This is such a cute look babe!! Love your pics - this looks like a great place to hang out! It really is a fun place to hang out at. Your pictures are too cute. I would be posing next to it as well :) nice post! I've never been to London but I'd love to go! Looks like a cute place! Love those metallic shoes! Hope you'll get to visit it soon. So obsessed with your shoes babe!! Metallics are so in for the fall season :) I definitely need to go to Camden Town next time I'm in London!! Yes, do visit it next time. Happy you liked the look! This seems like such a fun place to have a photoshoot and your outfit is amazing! I have never been to the UK, period! LOL! But it's definitely high in my list of places to visit. I really like your top, the slit at the back is a nice surprise. It was my first time and I really recommend it. I fell in love with the city! Happy you like the look. Camden Town is such a fun place to visit. I especially love all the different foods from all over the world <3 I love & miss London every time I have to leave, awww! You look beautiful, girlie. That top is so gorgeous!! Such a cute top! You're just adorable! Cool look and such a lovely location! Gorgeous outfit! Amazing blouse and shoes! Your outfit looks very comfy. Ah i need them shoes!! Lovely outfit! It is really a very nice place, cool, full of life and new ideas! 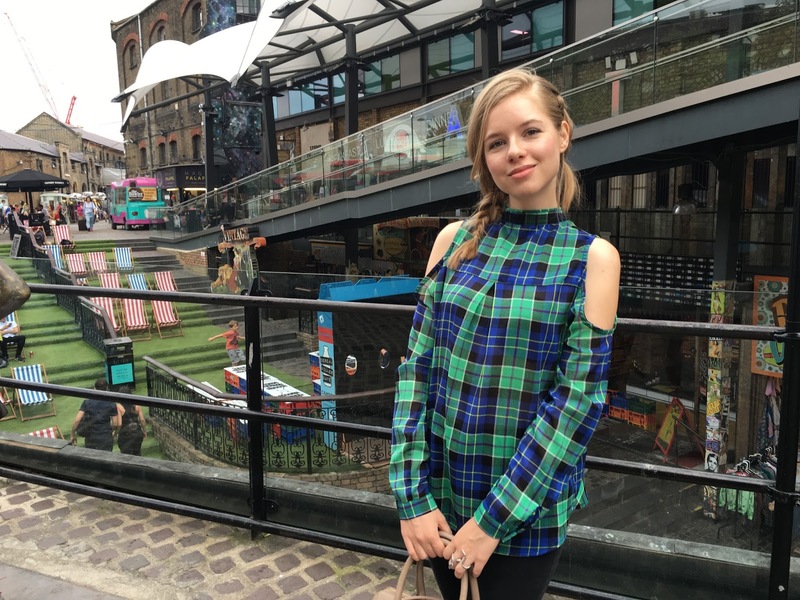 I told you that I loved this cold shoulder plaid top, nice colors! Loved the shoes too! I hope you have a lovely weekend! I want that semi shirt you're wearing!!!! I absolutely love Camden it's so visually stimulating! Love your top. It's so chic and elegant. This place is so cool! Love the London look girl! I adore this off shoulder shirt! Awesome post dear. I really love your style :)! Camden is undoubtedly a visual treat in comparison to many other parts of London, I agree! Your outfit is SO ridiculously perfect here, the green shirt looks great on you and those shoes, ah!! Ohh thanks for sharing these photos! I want to come back to Camden! Oh you look absolutely amazing in this look and it matches perfectly with this location! Fabulous outfit and love your plaid top. Unfortunately, I have never been to Camden, but I'm convinced it is really worth to visit! Love the fun unicorn and your wonderful and stylish blouse, too! Nice Outfit! I have nearly the same shoes and I love them!